Avastin For Breast Cancer: Hope Versus False Hope : Shots - Health News A cancer specialist on an expert panel that voted against keeping Avastin's approval for breast cancer intact explained his decision. He couldn't imagine recommending a drug that only limits progression of cancer without lengthening patient's lives or their quality of life. The Food and Drug Administration regularly courts controversy. But the regulator is treading new and particularly emotional territory as it has moved to revoke approval of the drug Avastin to treat breast cancer. Any day now FDA Commissioner Margaret Hamburg is expected to make a final decision on Avastin's fate. 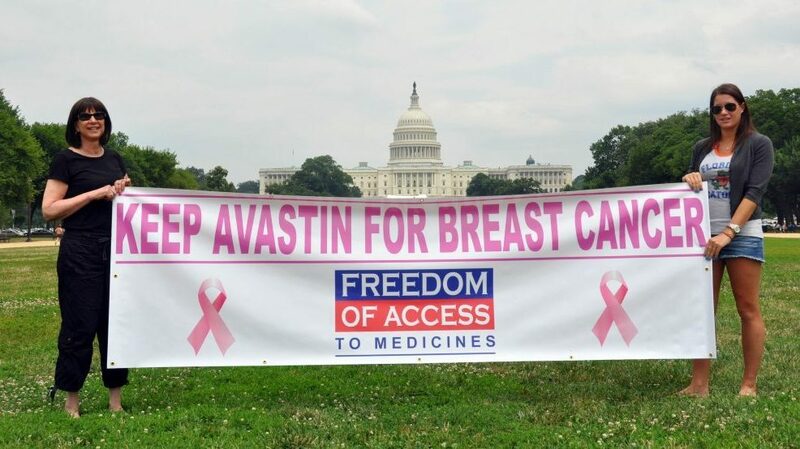 Women who said Avastin helped their breast cancer were out in force at a June hearing of an appeal of FDA's proposal. At this point, it would be a big surprise if the agency let the approval, granted on an accelerated basis back in 2008, stand. Well, I can offer you a drug that will not make you live longer, won't make you feel better, and may have life-threatening side effects, but it will keep your cancer from worsening by an average of 1 to 2 months. As a member of the FDA's Oncologic Drugs Advisory Committee, he tells Shots he kept butting his head against the evidence that showed Avastin's benefit, such as it was, amounted to a little more time without breast cancer getting worse. Should this progression-free survival "in the absence of an overall survival advantage or any improvement in quality of life" sway a patient? In the end, Sekeres saw it as a Pyrrhic victory for the drug and decided it wasn't enough to keep the approval for the drug intact. "My job is to be honest with my patients and to explain the goals of treatment clearly and to make sure I'm following what their goals are," he says. And, perhaps most importantly, he adds, "to give hope but not false hope." He acknowledges the heartfelt "testimonies by women treated with Avastin" at the hearing. "They moved us," he says. With his letter, he says, "I wanted to put more of a face on ODAC. We really think about patients sitting three feet away from us in exam rooms." We did not make this decision because we do not care about women with breast cancer or because we want to deny them therapy for a terrible disease but because we do not want people to be hurt by a drug that does not work that well. We do not want to provide false hope.